Has Old Louisville reached it's potential? Please let us know your opinions on the status of our neighborhood. What, if anything, do you think needs to be changed? Are there any problems that have not been addressed? Do you have suggestions for the improvement of Old Louisville? Do you have suggestions or comments about this web site? People are listening! Go to our Feedback Form and speak out! I am a Louisville native, born & raised in the West End. I attended Flaget & UL, then moved to various cities with my job. I'm retired now & live in Sou. CA but I get back to Louisville occasionally and I find that it's changed greatly. As for Old Louisville, I assume that it's the area of 1st thru 7th sts. S of downtown out to UL. It was just an area of big, old homes back in the 50's when I was there. I'm glad that they've been renovated now. I do remember St. James Court as being very trendy back in the 50's however. I miss Louisville. Is anyone watching what is going on at 1435 4th street? I saw them hauling out at least 5 mantles last week. Copper thieves are hitting in old louisville again in wee hours of the morning . Keep an eye out and report any sightings to the Louisville Metro police department . Everyone needs to be made aware that the Indiana State Police have a speed trap set up in the area North and South of the Kennedy bridge on interstate 65 . This is just an advisement to anyone needing to move their prescriptions to Kroger pharmacy . Do yourself a favor and go to Waggoner Pharmacy ! Kroger Pharmacy is at best a joke ! The people are rude and if you send in a prescription over the internet you just might not get it ! To get into Louisville from 64 east in Indiana take exit 121 from the left lane and follow all detour signs. To get into Louisville from 64 west follow the signs to St. Louis and get off at the 3rd street exit . Old louisville is straight ahead on 3rd st . Churchill downs is in the same direction . So is U of L.
To get to 65 in downtown Louisville from 64 west Get off at the 3rd street exit . Go under the convention center to liberty street , liberty street is after Jefferson Street . Make a left onto liberty and you will see an overpass . Go under the overpass and pick up 65 North . Go over the Kennedy bridge and get off at 6B. 6B will put you on 265 , 265 will take you back to 64 West . For those from Indiana going 64 east to Louisville again pick up 265 into Louisville . Just follow the detour signs. Sherman Minton Bridge is closed between Indiana and Kentucky . Detour to Indiana from Louisville is the Kennedy bridge that can be picked up in Downtown Louisville . Take hwy 65 North in the direction of Indianapolis , than get off at 6 B , 6 B will be 265 West , 265 West will than after a couple of miles you will find and pick up 64 West again . What was the name of the neighborhood grocery store on the corner of 26 & Walnut In the 1940's or l950's? How did the street "Pope Lick Road" (Louisville, KY) get its name? Is it based upon an incident? Due to time , there is not enough time to keep up with updating ! Even though everyone tries ! There is a lot more updating at http://www.oldlouisville.org . The old Louisville information center website . They have a lot more volunteers ! You can also find the Old Louisville Newsletter under neighborhoods at that site . Thanks for visiting ! I have lived in Old Louisville on 1300 block of 1st St. since November last year and just love it. 2 weeks ago I walked through the neighborhood down 1st St, up Ormsby and then up 4th to Central Park. I then walked through St James and Belgravia Ct to make my way home....what glorious vistas along the way!!! Look up people!! The turrets and roof lines are as interesting as any residential neighborhood in Europe! I'm really looking forward to Shakespeare in the Park later this month. I'm sorry about those suffering from crime, for some reason I always seem to see alot of police around. So far I've been safe and sound where I live. I see residents young and old walking their dogs, jogging, tending their yards..There always a few to spoil things but overall after living in the suburbs for 30 years I love it here! Old louisville was the first suberb in Louisville . Living outside of the city center . The city itself was built on the riverfront . While I was planning my trip to see Old Louisville next week, I found your excellent site. Just curious - why is Old Louisville so far from the riverfront? A problem with flooding in the early days? The city did a great job cleaning the streets after the Marathon this year ! The sun was shining and it looked like all were having a great time ! Crime has been on the up swing in old Louisville recently. After meeting with the Louisville Metro Police department they have asked for anyone interested in crime in the city to send in their email to the police department. They will then send you information on crime and a map as to crime locations .Police patrols are being increased . Also never leave valuables in plain view for criminals. Set your alarms day and night if you are away. Be aware of yor surroundings ! Lock pickers are out in force in Old Louisville ! Might be a good idea to set your alarm if you have one ! Also doors are being kicked in. Homes in the 1400 block of south third street have had bicycles stolen in rear yards and house broken into . The city is looking into cutting down and adding paver stone to the alley On Magnolia street between S.Second and S.Third street to help with drainage . What do you think ? During the last flood in this area I was standing in almost four feet of water . I think we need more than a cut down and paver stone . During the last flood water was filling basements and garages. Water was coming up out of the drain . The information Center needs your input . Herb Fink is dealing with the city on this one . Have a happy new year all ! I am going to hate to see the utility bills this month. Have four furnaces and still had to add a few space heaters. Hope we do not have any ice storms as we did in the past ! Dont forget the holiday house tour. http://www.holidayhousetour.com. Part of the old theater building at fourth and oak burned today . It will be a sad day when Mr. Jerry Abramson is no longer Mayor. The city has changed in so many ways. We still have a way to go , but we are on the go to get there. Best wishes Mr. Abramson. I hope you all have your I pads by now. There are many apps to study language if you travel around the world. Also many apps. for all of you medical people out there. Stop by an apple store near you and take one on a test run. Great for reading the Old Louisville news letter in your easy chair. We enjoyed and made many purchases at the art show. Remember to read your online newsletter at http://www.oldlouisville.org under the neighborhood section. Halloween was good this year with many in costume. We went through two grocery sacks of candy. The trick er treeters were very polite and friendly this year. CarlyRae's has reopened and it's better than ever. Something doing every night and now it has, not only the biggest, best patio in Louisville, it has the biggest TV in Louisville. check it out. just type in m.louisvilleky.gov on your phone. You can now put Louisville's website on your mobile phone . http://www.m.louisvilleky.gov. In Kentucky you can open carry a handgun as long it is plain view . Or you can go to the sheriff's office and get a concealed carry permit. Since there are so few police officers in Old Louisville it seems we have no choice but to protect ourselves. I had called the Louisville City Police not long ago. I was told no officers were available. With cut backs this is even happening in other cities. What is up with drunk people sleeping on peoples front porches in Old Louisville. Had a guy the police were chasing crashed on my porch then busted out my window. Why is it there are only two police cars patroling all of Old Louisville. And why are they moved from Old Louisville when something is going on downtown ???? I was hoping that The Old Louisville Victorian Ghost Tour would take place in October of this year. I was very dissapointed last year when we got to Louisville and there was no Victorian Tour. The special thing about the Victorian Tour were the "Real" ghosts that would appear during or after the story was told and the ability to go into some of the "Haunted Homes". I know that it must have been so much work to get all of that organized, but my husband and I and my friends loved it and have been coming for 4 or 5 years. We miss it and wish that you all could get that together again. I believe that at one time there was even a carriage ride around the fountain in St. James Court. Just wanted to let you know how great that tour was and am hoping that you could bring that back! Thanks! People from all over the world live in Old Louisville. Many go to church some do not. What kind of churches are in Old Louisville. Is there one for all religious groups ? How many religions are there. Go to http://www.adherents.com. Use Google toolbar translator to translate language of any website. Everyone that loves horses in Kentucky. Visit http://www.srs.at. In Vienna Austria. We were there and gave them information about Kentucky. And the Old Louisville website. Did you know http://www.oldlouisville.com also has http://www.altfrankfurt.com ? Saw many nice people and places in Prague Czech Republic and Vienna Austria ,this year. People from Old Louisville are from around the world. Many in Old Louisville , travel around the world. Why is it most Americans speak only english ? When people from places like Europe can speak many languages. Do our schools think we are too stupid ? In America we all should know two languages ,if not more. Thank you so much for a walk down memory lane.I was born in Louisville and lived in and around Old louisville most of my early years there.We live at 802 and 838 south 1st street.We also lived at 117 east Brackenridge.My Mother worked at a little restaurant called The Dinenet Grill in the 800 block of 1st. At 1st. & Brackenridge was Davis drug store. Also on that corner was a small service station and a liquor store.The small building of the service station is there today.There was an A & P food story at 842 south 1st. One block north on the corner were two bars.We also lived in the 900 block of 1st. and two places in the 900 bolck of 2nd. I went to school from the 1st grade to the 6th at Victor H Engerhard when it was on Kentucky street. We ran the streets day and night never fearing anything. I would'nt do that now. That was all 60 years ago. I wish we had taken more pictures back then as most of the places I lived have a long time goin. I know most of what I speak of is just north of what is now called Old Louisville , but I remember it well. I would like to see some pictures of the things I spoke of if possable .Thanks agen. You might notify all of the pawn shops. Just google pawn shops Louisville Kentucky. No matter where you are these days it seems people are held up. There was a rash of home break ins in Bullit county. Just a few weeks ago. Hair spray works well if someone is trying to mug you. My wife and I were visiting Louisville on the weekend of the 24th for a wedding and got robbed at gun-point near Ormsby and 3rd street. They stole my wallet, keys, cell phone, and my wife's engagement ring. We currently live in Michigan, but if anyone finds our ring in a pawn shop, please please please send me an email at hpisloud at gmail dot com. We will reward you for your efforts. 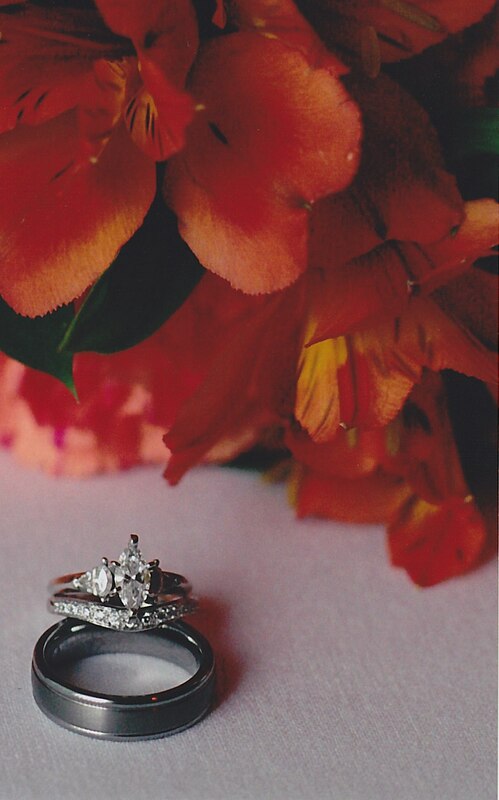 In the picture, the engagement ring is the one on top of the other 2 rings. Yesterday morning, barely four stoplights away from old Engine 7, another vintage building burns, gutted by fire. Go to :http://www.oldlouisville.org and click on neighborhood at that website scroll down to the current newsletter. Http://www.oldlouisville.com is a private website. Sometimes it is not kept up to date. http://www.oldlouisville.org is the official website of the Old Louisville information center. Everyone now can do their part to save Old Louisville. Everyone now can cut down on air pollution by driving a hybrid car, and install a 90% eff. furnace system. We can also go to electric weed eaters, blowers, and lawn mowers. Also be ready for any flooding in your basement by checking to see that your sump pump is working if you have a basement. We can all also chek to make sure street drains are clear for the April showers. Do not purchase computer related devices from staples on Preston street in Louisville. Or you will be sorry that you did ! This is a notice to all in Old Louisville that have Blue Cross and Blue Shield Medical insurance. If you are involved in an auto accident no matter that it is not your fault. If you have an injury, and Blue Cross and Blue Shield finds out . You will lose your medical insurance faster than you can even get to a doctor. If you have Blue Cross Blue Shield insurance. You will have no medical insurance at all to cover any of your bills. Due to a car accident. Who is filing the apartment listings with spam??? Come to the Holiday House Tour : http://www.holidayhousetour.com. What a wonderful resource! The history of street addresses was a fabulous find when researching a building. Thank you SOOOOOO much! There is just so much available at just a click that I was astounded. I realize a lot was lost in the '37 floods, so this is a delight to be able to find so much here. I'm not done yet, but just wanted to give a special thanks for the street address/resident history. I’m trying to research the Parrish that resided at 1119 S. 4th Street (now 1027 S. 4th Street) Is there a link that may help me there? I had found old newspapers from the area online somewhere, but after back clicking to the original link, I can no longer find that site.. Thank you for the obvious work put into this site! Recently there was flooding in Old Louisville. M.S.D. is trying to clean drains in Old Louisville at this time. However, People continue to park over the top of these drains even when M.S. D. post no parking signs. That means these drains can not be cleaned. If you see cars parked on these drains during the posted no parking time . Please notify LMPD to ticket these vehicles before the next rain overtakes Old Louisville . LMPD 574-7010. Jim Dillon and Peggy Wooten both could be seen at the corner of S. Second and Magnolia for many years. Both died a tragic death. Peggy died by being crushed by a van. Jimmy died in a fire. Maybe we all need to come together and fnd a way to create a memorial in their memory. Addy for Funerl home is 1201 E. Oak St.
Jim Dillon of the 1300 block of second street has died. He was in a house fire last week next to the Magnolia bar and grill. Funeral services will be held 10:00a.m. Wednesday at Holy Spirit Catholic Church 3345 Lexington Road with entombment to follow at Louisville Memorial Gardens West. Visitation will be held at Arch L.Heady Russman and Sons Funeral Home from 4-7 p.m. Tuesday. The family would like expressions of sympathy to take the form of contributions to the Louisville Fire fighters Fund. Many people are hit by cars in the south because of in attentive drivers or while riding a bicycle. For care for your self you will need up front 10,0000 $$$$$. Worth of insurance. No Md, in Kentucky will see you if they are aware you have been in an auto accident. Due to lawsuit paper work. This is only the beginning of your horror of anguish and pain. Within the legal system. Find postings of this years flood in Louisville at http://www.youtube.com. Does anyone know what building stood on the south east corner of 6th & Main streets. It's a parking lot now & has been for at least 50 years. I lived in that building for 2 years in 1951-52. How can you tell if your contractor is telling you a lie. http://en.wikipedia.org/wiki/Facial_expression. Has anyone ever noticed that the grocery stores in the east end have better meat counters than the ones around Old Louisville. Do the grocery stores also profile ? Just a thought ! Why is the un-employment rate so hi in Kentucky ? It is fairly simple ! Many in Kentucky are smarter then they use to be !!!! Today contractors in Old Louisville are dealing with people with college degrees. While they themselves have but a high school degree. Every used car salesmen thinks he is smarter then his customer. Look around how many car sales parking lots in Old Louisville are now vacant...............The old saying goes !!! Thy shall not screw they neighbor !!! Or with it the information shall flow !!!!!!!! I wold rather my building fall to dust then to hire a thieving contractor. We need to start a list in Old Louisville and run them out of business. Sen. Mitch McConnell voted NO on a Cloture Motion to provide Federal assistance to States, local jurisdictions, and Indian tribes to prosecute hate crimes - Vote passed by 63-28, 9 Not Voting. Sen. Jim Bunning was one of those that did not vote. For anyone who lives in Louisville. For anyone who lived in Louisville in the past. Not only is Old Louisville on the come back. The city and the riverfront is also making a come back. I went to the river today from Old Louisville. I could not believe what I saw. The riverfront now looks like a place where tourist would want to come. Everyone needs to go see it. Are you tired of finding scratches and dents in your bumper when you park in Old Louisville ? I found something on the internet for city parking. I bought two of them. Go to http://www.superbumper.com. These are a must have for us city people. Save your bumper !!!!!!! Much of the information can now be found at http://www.oldlouisville.org . http://www.oldlouisville.org is the official website of the Old Louisville Information center. The newsletter with all info can be found by clicking on neighborhoods at the http://www.oldlouisville.org site.. The website you are on now is http://www.oldlouisville.com. http://www.oldlouisville.com is still a great site with a lot of info. on Old Louisville however it is not owned by the Old Louisville Information center. It was being borrowed as the Old Louisville information was updated to high speed internet. Old Louisville now has many websites. Just remember .org is for the info. center and .com is for a lot more info. That means we have twice as much info as we did in the past. Please update your calendar... I found myself on the 2008 calendar and was very confused. Recently I watched as one of my neighbors had a roof replaced.It was replaced by http://www.bonedryroofing.com. Looking at it from the ground it looks nice. However the upper area has exposed nails . And the flat roofing edges were nailed and tared over. This is poor workmanship, and a leak waiting to happen. Many new roofs leak due to roofers on the run. This is a good article for everyone to read. http://www.thisoldhouse.com/toh/article/0,,194076,00.html. There will no longer be a paper newsletter. Get the newsletter at http://www.oldlouisville.org Just click on the neighborhood link at the top of the page. I am having trouble getting this website on vista : To webmaster. Information center going green ? Send your e-mail to http://www.oldlouisville.org Official ,website of the Old Louisville Information Center.Get the newsletter delivered to your e-mail. As a Louisville transplant, I have been really enjoying learning about the city's history. Thank you for the wonderful pictures and information, as well as accounts. Please keep up this wonderful website!!! The mailbox at 3rd and Magnolia has been removed by the Postal service. Get your bicycle needs downtown http://www.bikedepot.org Soon close to Old Louisville. Old Louisville is so large I was going to add a second monitor to my computer so I could see the entire place. My computer has a card with a vga and dvi-d connection on the back of it. You can hook up one vga monitor and one dvi-d monitor .This is a notice to everyone that might want to see old louisville on two monitors. If you need a dvi-d to dvi-d cable to hook up your monitor you will not find a cable at any store in Louisville . You can get one on the net. The new trick all of the stores in Louisville are doing now to hook up your monitor is first you have to purchase a new monitor with a hdmi connection then they will sell you a new cable hdmi to dvd-d for an extra $75.00. Make sure you have the cables to hook up a new monitor , before you purchase one. Also make sure you have the proper card to hook up two monitors. Just a tip from a neighbor. To make Old Louisville a better place donate your old computer to someone who can not afford one. Thank you for posting the website http://www.howstuffworks.com . In education we trust . That seems to be http://www.oldlouisville.com s goal. Thank you webmaster ! With recent rains , some of you might have gotten water in your basement. A few years ago I too got water in my basement. The problem with regular sump pumps is the intake is at the bottom of the pump. If you get mud or sewage in your sump pump , or if your electricity goes out your sump pump is not going to work. Your basement will flood. The answer is a sump pump made by wayne. The model # is ISP40. I have one . I got mine at Lowes on the east side of town. You can also get them on the net. Just google wayne sump pump ISP40. The advantage to this pump is it has a stack on it with a screen . Mud or sewage can get several inches up around the stack and water can still flow into it. With no electricity the batteries will run the pump for up to 20,000 gallons. Everyone can now keep up with regular news in Louisville, Kentucky on their cell phone. Go to: m.courier-journal.com. More information can be found at http://www.neighborhoodlink.com Go to zip code 40208 . Then you will see the Old Louisville section. The information on our home at 1461 S. 4th Street is inaccurate. * Please contact me to make corrections. We have done a thorough house history and can document the corrections to be made. *1461 South 4th Street (1904) Homestead Charles H. Wintersmith, Wintersmith Medicine Company This 2½ Story brick residence has an irregularly patterned, Bedford limestone veneer (not original) on the façade only. A classic porch wraps the north side of the house. Many of us have been trying to avoid panhandlers in Old Louisville, as well as downtown. Today I saw a law officer give a panhandler money within a business. This makes it difficult for everyone. Warning to all ! Subject :Identity Theft. Many of us use a shredder to stop identity theft, however how safe are we ? Recently I was listening to my police scanner as police were sending over their radios names , addresses, and social security numbers of people . Could have one of these people stolen your wallet and used your information to give to the police ? Is it your name, address, and social security number going out over the air. If it is, anyone with $129.00 can go to radio shack , pick up a police scanner and if someone tries to use your I.D. and it is broadcast over a police radio, Your identity can be stolen. Broadcast directly to the identity thief by the very people that are here to protect us. Grafitti artist are at it again. Yes even in the cold of Feb. The east side of the 1400 block of Sout 3rd st. was hit last week. LMPD has seen the painting on the walls and said they will try to step up patrols. They said however they could use some help from the eyes and ears of the neighborhood. Home owners are responsible for cleaning up the grafitti on private property I was told. Thank you for listing Old Louisville churches. Please update the information for our listing: Our pastor is Rev. Dr. Jean Hawxhurst, and our website is www.fourthavenue.us. We post them as we get the files from the Information Center. We received nothing September or October, and the info center does not keep a copy after they send it to the printer. The November newsletter was posted on line before the printed version was sent out. I was born in Louisville and grew up in and around Old Louisville. I have asked before if anyone knows what building was on the South East corner of 6th & Main. It has been a parking lot since the 50's. I lived in that building when I was 6 years old. I can't find any info on it. If you can help please E-Mail me. Thanks. Louis. Prop421<AT>aol.com. Why is it that there are so many white ,drunk U of L students trying to distroy the beauty of Old Louisville by trashing it during parties? Why does the Louisville Police department refuse to respond to these out of control parties ? I love brink, I love original wood siding! However you do a disservice by stating things like Vinyl siding fades (to the degree and at the speed you state) and can't be painted. I own three homes, two are investment properties, all three homes have vinyl siding. One home was done 17 years ago and though it probably faded a bit, it still looks like new with yearly spray downs. In fact I had the house on the market for a short time and some of prospective buyers thought the siding was brand new. House #2, had ugly green vinyl siding. Contracted the painting out, the painter assured me with proper cleaning, that right primer and paint the paint will last for years. 11 years and the pale yellow still looks great, no peeling, nothing wrong with it. I spray it down once a year. House #3, I purchased about five years ago, white vinyl siding aprox 15 years old. We were thinking about getting it painted since it's boring white, but after spending 30 minutes going over the house my wife and I decided there was no reason to, it still looks very good. The only maintenance we do on our siding is yearly beginning of spring spray downs. I'd call "practically" maintenance free. This is a very cool website. My family lived on Belgravia Court from about 1964 to 1966. I was only 5-6 years old, but my memories are very vivid. I distinctly remember the buckeye trees on St. James Court and the Shakespeare stage in Central Park. I remember that a couple of our neighbors were Johnny Randolph and Weird Beard, disc jockeys at WAKY radio. Before that, we lived on 4th St., right across from Central Park. The name of the building was The Park, which I'm guessing isn't there anymore. I also attended Cochran Elementary School in the first grade. I noted with pleasure the picture postcard of Covin Cavin School, which was called Gavin H. Cochran or "Cochran" Elementary when I attended there from 1956 through 1961 when we lived just around the corner between 2nd and 3rd Streets at 218 East Hill Street and later on at 1900 South Brook Street over Sloan's Grocery. Then we moved to 1417 South 1st Street where we lived from 1957 until 1963 when we moved out into the county in Okolona after I had attended the 7th and 8th grades at duPont Manual. It was a great area to grow up in and we always had great neighbors while living in Old Louisville.